The history of protection amulets extends far back in time to ancient civilizations, such as those of the Assyrians and Egyptians. From the earliest of times it seems that humans have always endeared themselves with some form of magical amulet protection against the forces of life. Sacrifices, prayers and offerings were the main way to receive blessings, but wearing a protective amulet kept the evil spirits from taking them away. Those who wear amulets of protection believe they are imbued with magical and mysterious powers. 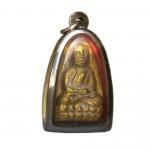 Protection amulets are usually worn on the body or kept close to the body. Some amulets are not worn on the body -- these usually guard buildings, homes and tombs. The Jewish people place a religious amulet by the door of their homes as a form of protection. Buddhists usually put a spirit house in front of their homes and businesses and leave amulets in it. But protection amulets can take many forms, such as symbols, rings, plaques, animal shapes and seals. Other forms of protective amulets can be seen in some Africans carrying a pouch of medicine. When a member of the tribe was suffering from an ailment, such as a stomachache, the pouch or magical amulet was placed near the impaired body part. In other cultures, small bits of parchment or paper with quoted scriptures were carried in pouches or put in small boxes. Ancient pagans were known to wear figurines of their gods around their necks, which is very similar to what many people do today. 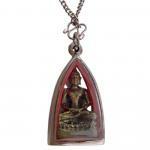 Buddhists usually wear a figure of the Buddha or a revered monk around their neck. 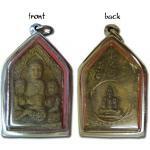 These Thai amulets can be seen all over the country and in the cars and homes of the people. While protection amulets may have changed in appearance and style through the centuries, their basic function remains the same. Rationalists and skeptics may not believe in the power of amulets, but their use through the years by people all over the world would suggest that there is at least some merit to their use.